Transparency International Sri Lanka’s legal arm Shelter for Integrity the Advocacy and Legal Advice Centre (ALAC) has so far received 20350 complaints from the public who have experienced corruption while obtaining a service from a State institution. ALACS provide the public with the opportunity to seek legal advice free of charge when they have experienced corruption while obtaining a service from a State institution. These centers provide information on available mechanisms to pursue complaints, and also mediate between State institutions and complainants in order to find lasting solutions to grievances. The first ALAC, the Shelter for Integrity, was launched in Colombo on 5 April 2012. 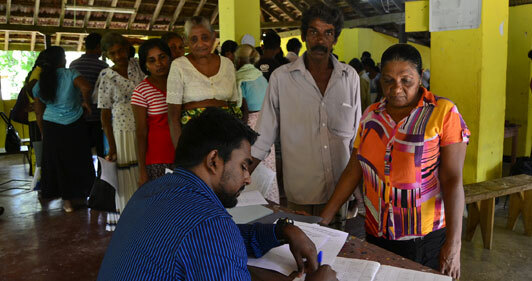 Following the success of the Centre, branch offices were opened in Batticaloa, Matara and Vavuniya. Each office offers face-to-face free legal advice as well as operating a hotline for the provision of advice by telephone. Since the inception of the Shelter for Integrity have managed to find remedies for approximately 60% of the complaints whilst many of the cases are currently being pursued. Lawyer Jagath Liyanarachchi the manager of ALAC said in many cases they have advised the client to go before the courts and helped them to prepare all the relevant documents to purse a court case. “The other significant feature is that we managed to identify systemic corruptions taking place in the government institutions. As soon as we come across to such a issue we engage with the authorities to prevent them happening” said Liyanarachchi. Government agencies have provided positive feedback to TISL and continue to support the work conducted at ALACS. Moreover, following referral by TISL, State bodies, including the Human Rights Commission, Child Protection Authority, and Railway Department, have all initiated investigations regarding corruption-related complaints, he added. The substance of these complaints is wide-ranging, from fraud, bribery and blackmail in connection to State institutions, to corruption and malpractice in the workplace. A large number of these complaints stem from concerns regarding mismanagement of land deeds, non-issuance of permits, illegal sale of State land, and unlawful occupation of land. In these instances, clients were advised of appropriate avenues to rectify irregularities and seek redress. ALAC continues to work towards empowering Sri Lankan citizens to pursue corruption-related complaints and requests the public to visit its centers or make complaints to its hotline 0112501503. ALAC believes that this shift in expectation, coupled with partnerships with State institutions aimed at improving governance and service delivery, will lead to a new culture of non-tolerance of corruption.